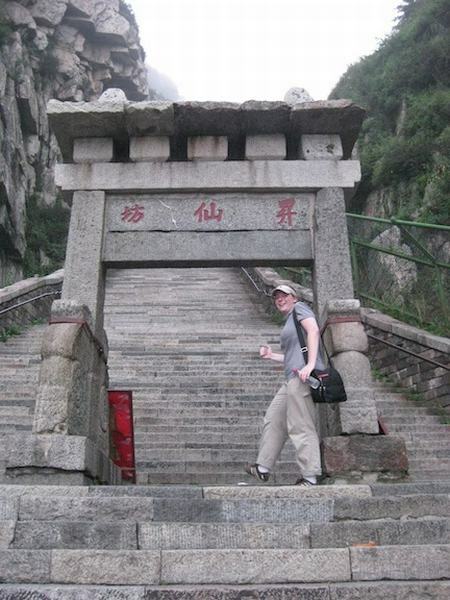 Way Away interviews Becky Ances, a writer, traveller and tea drinker living in China. Enjoy this interview about travelling around China and follow all her travels, advices and stories around China at her blog. In Yunnan province at the famous Stone Forest. The ‘forest’ is actually karst peaks jutting out from everywhere. 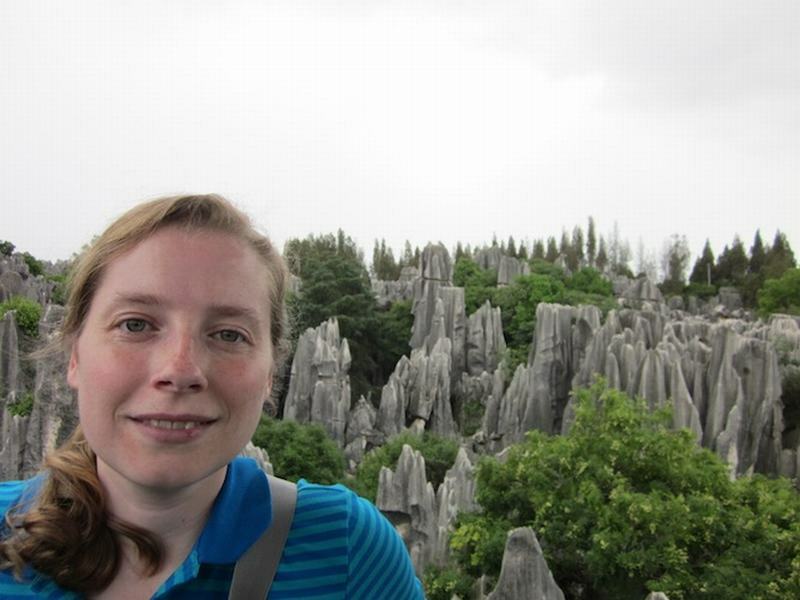 In Yunnan they say that if you haven’t seen the stone forest, you haven’t really seen Yunnan. – What is the most impressing place in China you have ever been? What advice would you give to someone who wishes to travel there? One of my favorite things to do in China is climbing mountains. Most mountains in China have spiritual and historical meaning in addition to being a beautiful natural place. You don’t just climb a mountain through the woods, but usually follow a stone path (with lots and lots of steps!) and you pass by temples, small villages, ancient stonework and more. It feels more like an adventure through time than just climbing. The most important mountains (like Yellow Mountain and Mount Tai) are located outside of the cities, so you’ll need to travel to get there. But being as they are so famous there are plenty of buses and ways to get there. Sometimes it might feel daunting to get out of the big cities in China, but it is absolutely worth it. – What do you hate to forget in your suitcase when travelling? Deodorant! It is not commonly used in China so finding it if you forget it, or run out, is really difficult. I stock up when I go to America and ask my parents to send me some to make sure I never run out. And I also never go anywhere without a packet of tissues in my pocket, as toilet paper is not commonplace in China. I am not a fan of groups. I have done a few organized tours in China because it saved me money on doing it on my own, but never again! You spend one rushed hour at the amazing site, then two hours at some stupid silk or jade factory. It’s not worth the small savings. The thing to remember is that popular tourists sights want to get you to visit them, so there are always buses and ways to get there, and resources for English speakers. It takes a little bit of courage, it seems nerve-wracking at first, but it is ultimately much more rewarding to do it by yourself. Also, if you feel really nervous about taking public buses to tourist sites, in the major cities you can always hire a car often with an English speaking driver. It’s more expensive (but cheap compared to western prices) and you have a car and driver at your disposal so you can take all the time you need at attractions and not worry about someone else’s schedule. Even in smaller cities I have rented taxi driver for the day to take me around. – What kind of food have you tried on your travels around China and you found it delicious/surprising? Can you recommend us any place where to try it out? The happiest surprise regarding food is street food. You can find incredibly delicious and cheap food just about on any street corner. Things like baked sweet potatoes (so delicious on a cold winters night), steamed baozi, barbecue chickens legs and sugar covered strawberries. I’ve eaten a lot of street food and never gotten sick as a result of it. Each region has its own special dishes so if you happen to travel to Beijing you can go to the famous night market next to Wangfujie and try crazy things like grilled starfish or scorpion. 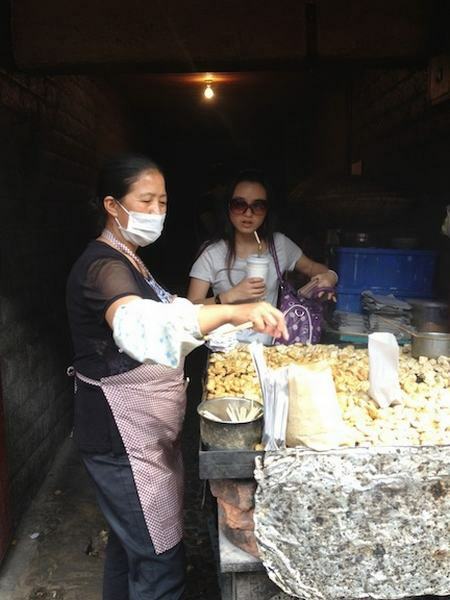 But for normal street food in Beijing, head to the historical hutong areas. As you wander the maze of traditional homes you will pass by many vendors selling all different styles of food. In Shanghai the specialty is spring onion pancakes and dumplings called xiao long bao. I’ve found the area near the Shanghai Library in the French Concession is a great place to wander and snack. Some famous grilled tofu in Kunming. As long as the food stand looks relatively clean, and many people go there, it’s probably safe to eat. – Finally, tell us something that happened to you travelling and that you will never forget! My best friend is a Chinese guy and one winter break he invited me to his hometown. His family lives in a very small village and I got to meet his parents, grandparents, cousins and more. I’ve never been in a more comfortable or hospitable environment despite me not being able to communicate very well with them. One day my friend and I took a hike in a totally secluded gorge. There was not another soul in sight except some chickens. They followed us as we walked, and made soft clucking and cooing sounds. They also walked on tiles broken on the ground which made a very melodic tinkling sound. At one point a pair of herons flew by and landed on the jade green water below. The place was so peaceful and quiet I could hear their wings flap as they took off and flew away. It was the most peaceful moment I have had in China, a place not known for it’s quiet! 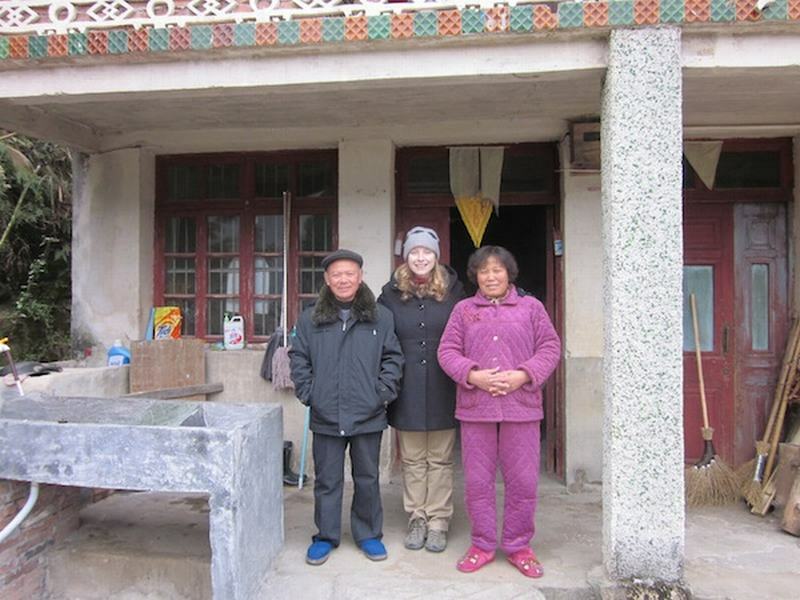 Becky with her best friends grandparents in their home in a small village in southern China. While we couldn’t communicate directly (my friend had to translate) me and his grandparents got along very well, and I felt really comfortable in their cozy house. Thank you Becky for your time! Do you want to know a little bit more about the Becky? Here you have a little biography: Becky Ances is an American writer, traveller and tea drinker who has lived in China for more than three years. During the school year you can find her in Southern China teaching English to university students, but during holidays she is wandering and exploring. You can read about her adventures at www.beckyances.net.